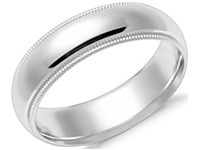 The finishing of a wedding band can truly emphasize and portray your distinguished style and taste. 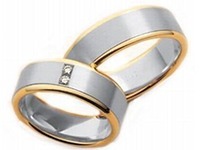 Because of this, we here at www.WeddingBandsWholesale.com are pleased to offer you a vast range of finishes, many which are free of charge, to apply on any of our wedding rings and add that final touch of distinction that you need to make your wedding ring, truly yours. 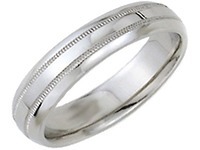 One of the final stages in manufacturing wedding rings is indeed the finish of the ring. 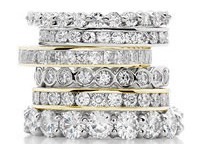 This process is conducted here in our factory located in New York City by our expert jewelers and craftsmen ensuring that each ring is taken under careful consideration to bring out the best in the precious metal you have selected. Take a look at our selection of finishes and when you decide on the one that suits you best, you have the option to choose this on the product page as you place your order. 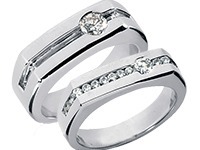 While each product may not offer each finish, www.WeddingBandsWholesale.com would like to offer you the option to create any ring we offer in any of the finishes provided for you giving you the ultimate freedom in creating your beautiful piece of jewelry. 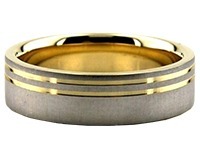 The Vertical Brush Finish appears to have a brush stroke appearance around the wedding ring. 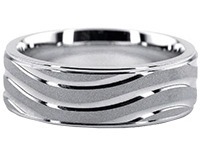 This finish has the “brush strokes” appear vertically along the band. This look is slightly dulled but is distinct in the strokes. This finish emphasizes a more classic and refined look that is both subtle and elegant. 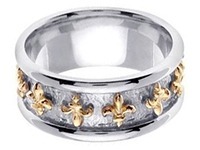 The Shiny Finish is the most popular finish available for men and women’s rings. 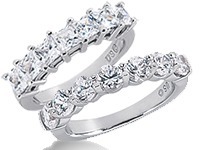 Having a clean high polished look, wedding rings with a shiny finish have the highest form of gloss and brilliance. This finish is the most distinct as it emulates luster with the most neat appearance. The shiny finish option allows for the most comfort friendly wear available as there is no friction between the ring finish and your fingers. 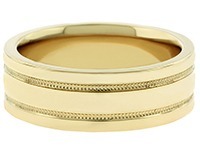 Also, a shiny finish lessens the effects of normal wear and tear on a ring as it does not create a contrast to the color of natural gold. The Satin Finish is a beautiful finish that combines the vertical brush finish and the attractiveness of the matte finish. The satin finish has a brush stroke appearance that silhouettes the ring in a horizontal motion emphasizing the careful craft of its finish. With the light and airy look of this finish, the satin finish proves to be a classic look that is both refined and traditional. The Rough Satin Finish has a similar appearance to the satin finish with a slightly more intense emphasis on the brush strokes. The lines in between the brush strokes show a grainier and slightly coarse look. This finish is distinct and absolutely makes a statement to anyone wearing it. The Florentine Finish is a more contemporary look in finish as it combines a vertical brush stroke and a diamond cut shine that dazzles. 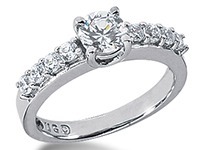 This is a rougher form of the vertical brush finish as the finish is created with a diagonal diamond cut appearance that creates a special and unique design for all to see. The Shiny Hammered Finish combines the striking shine and gleam of a shiny finish with the bold look of a hammered finish. To create this unique handmade look a small hammer is taken and lightly hammers onto the surface of the wedding ring. This is then polished to emphasize the facets created by the hammered finish. 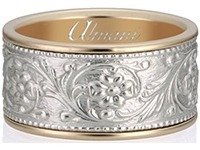 The shiny hammered finish in its creation guarantees that no two rings are exactly alike, which creates a unique finish that only you can have to share. 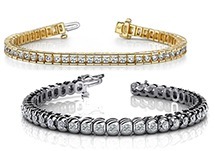 It is truly unique and the shiny addition gives it an extra dose of exceptional beauty. The Matte Hammered finish is similar to the shiny hammered finish, with a matte style instead of a shiny style. This creates a slightly speckled and softer appearance to the facets of the hammered look. This finish highlights a softer and less bold appearance than the shiny hammered look. It is both sophisticated and delicate with its unique beauty and character making this finish a true masterpiece, and one to be admired. 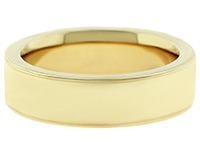 The Matte Finish is another popular finish used on both men and women who are opting for a softer band than the traditional shiny or satin finish. This finish entails creating a slightly speckled look that is evenly distributed throughout the band adding a touch of shine and depth. This finish is not dulled like the satin finish and brings out the beauty in the gold or platinum that it is created on. 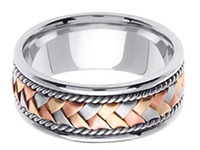 This finish can be used to reflect a more masculine look for men’s bands and a softer look for women’s bands truly emphasizing the flexibility of the matte finish. The Sandstone Finish is a very distinct from other finishes as it reflects a different process to create the effect seen on the surface of the rings. 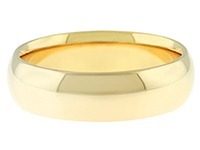 The sandstone finish is created to reflect distinct grains on the band. 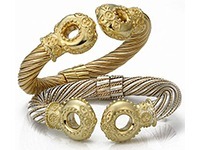 There is an appearance of a rough sand look which is crafted by using a professional blast tool using sand on the surface of the gold or platinum and then using a tool to smooth and dull the appearance to create a more subtle finish that is soft to the touch. The Diamond Cut Finish is both impressive and exclusive. 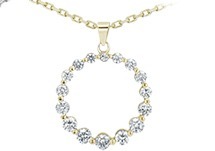 It offers shine and sparkle and releases radiance from all angles. 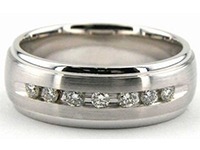 This finish is created by using a special diamond cut machine that creates facets along the surface of the band. The facets created capture light and then reflect this as shine and brilliance are a popular feature of this finish. 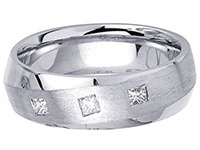 This finish is slightly rough to the touch but is still comfortable between fingers when worn. 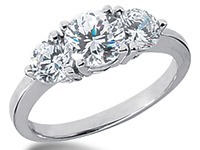 It brings out an amazing shine that is truly breathtaking. The Light Diamond Cut finish is notable and astonishing. This light diamond cut finish is a light take on the diamond cut finish with less emphasis on the facets created making this a truly genuine and brilliant finish. 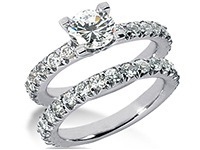 The appearance of this finish is softer and less bold than the diamond cut finish but is still a radiant look for any ring. The Rough Diamond Cut finish is highly distinct and full of sparkle. 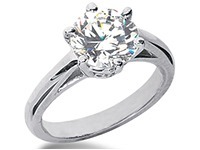 This finish is the most dramatic diamond cut finish as it attracts and captures light that is emitted in its brilliance and luster from all viewpoints. 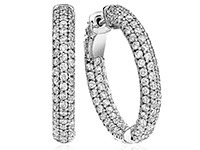 This finish offers a speckled diamond cut look with texture that is slightly rough to the touch but comfortable in wear. The rough diamond cut finish adds heightened appearance of quality and excellence unsurpassed by any other finish.